This post focuses on free shipping and its halo effect. It is the final part of a three-part blog series on customer loyalty. The series is designed to help retailers master the 6 key drivers that are directly linked to online shopper loyalty, and identify and resolve gaps in their customer experience. The online shopping experience is composed of many important layers, but most merchants struggle to excel at each one. To help them, we peeled back the onion to determine if there were specific parts of the online shopping experience that shoppers valued most and kept them coming back to a merchant. We surveyed 5000 Canadian online shoppers to weed out the factors that mattered most to them. What we found was surprising. 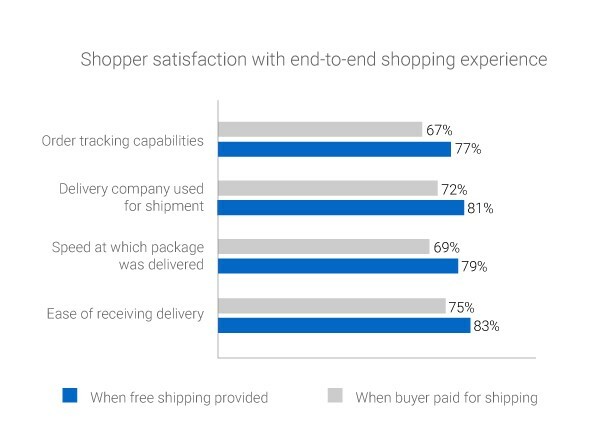 As it turns out, merchants can greatly improve their customers’ overall perception of their entire shopping experience by simply offering free shipping. It’s like giving someone a pair of rose coloured glasses. Every level of the online shopping experience seems to be a little bit better than it is. We’ve known for some time now that shipping costs are key to customer retention. They can make or break a sale for your online store. While low cost shipping is the most the majority of online retailers can aspire to offer to their customers, a memorable gesture like free shipping takes the weight entirely off of your customers’ shoulders. It makes the decision to buy from you hassle-free and leads directly to sales and fewer abandoned carts. If your business can afford to, you should offer free shipping to your customers whenever possible. Unfortunately, offering free shipping is too expensive for most merchants to do year-round. Giant corporations like Amazon are making free and low cost shipping seem standard, raising customer expectations to new heights and negatively impacting sales for smaller merchants who can’t compete. Retailers that can afford to offer it all the time can usually give their shoppers a better overall online experience. For the rest of the pack, it’s important to note that offering free shipping lowers customer expectations for their online shopping experience. It makes shoppers more tolerant of hiccups in their purchase journey. You wouldn’t complain about a delivery if it was free, would you? When shoppers receive free shipping, they bask in the glow of its halo effect. Every step of their journey is infinitely more satisfactory — even elements of the experience that have nothing to do with shipping costs. This halo effect seems to last well into the post-purchase experience. Shoppers usually remain tolerant and pleased throughout the remainder of their shopping journey — regardless of what mishaps occur during that time. 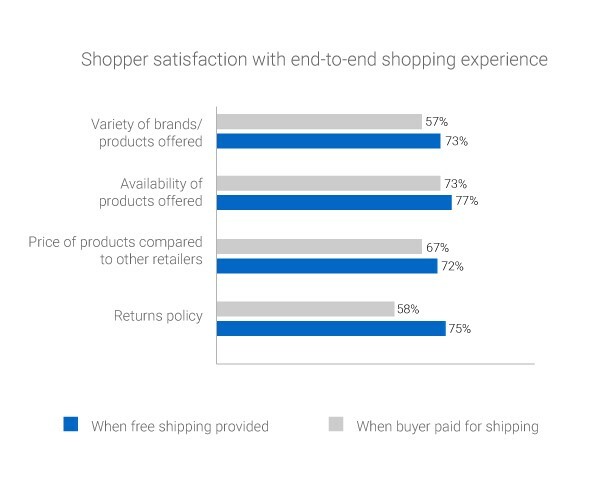 Free shipping enhances the online experience, but it’s not the only important aspect of it. E-commerce businesses who offer it should not use it as an excuse to neglect other areas of the shopping experience. Think of free shipping the way you would a house — without a solid foundation, even the nicest looking structure could crumble. If you can’t afford to offer free shipping regularly, consider leveraging it strategically during key shopping periods. As your business grows you can slowly implement it more often throughout the year. By offering it you will elevate your customers’ entire shopping experience, encouraging them to return to shop with you again and maybe even leave you glowing reviews. Want expert help about how you can leverage your shipping policy to help create loyal shoppers?